One of the most sought-after types of frozen seafood is vannamei iqf shrimp, Hayati Fresh & Frozen Seafood Shop Selling Vannamei IQF Shrimp, an introductory shrimp that was officially designated as one of the leading aquaculture commodities by the Minister of DKP in 2001, and since its development very fast. This shrimp is a favorite food for seafood lovers because in addition to low cholesterol, these marine animals are also rich in protein, essential fatty acids, vitamin D, vitamin B12, and calcium. Besides being healthy, shrimp are also very delicious to be consumed and processed in various ways, such as fried, boiled, roasted, or steamed. Seafood lovers must be used to using shrimp as one of their favorite food ingredients. They are looking for those who sell vannamei iqf shrimp to be processed into nutritious seafood. Of course you are seafood lovers want products that are fresh and durable. Frozen food will be more durable, frozen food itself is safe not to use any preservatives, this method locks nutrients in it, only need to enter the refrigerator or freezer to remain durable but still healthy. Shrimp is known as a food source that has very high protein and water content, therefore it is included in the category of food which is easily damaged or easily contaminated by decomposing bacteria. The freezing method used to maintain shrimp quality and freshness is one of the IQF (Individual Quick Freezer) methods. We Sell Vannamei IQF Shrimp, an IQF freezing method (Individual Quick Freezer) which aims that each piece of shrimp is frozen without sticking to each other quickly, continuously and not cut into pieces. The freezing technique of vannamei shrimp (Litopenaeus vannamei) with the IQF method (Individual Quick Freezing) has the principle of freezing the product individually by using cold air gusts. The cooling source used is liquid ammonia. Before being used, the IQF engine was set to -30 0C to -35 0C with freezing time 7 to 15 minutes and the center temperature of the shrimp -18 0C to -22 0C as the critical limit reference. 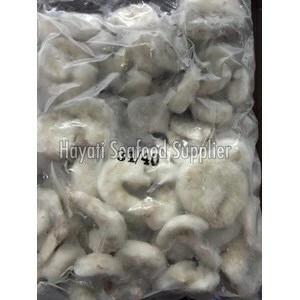 We Sell Vannamei IQF Shrimp with the advantages of vannamei shrimp freezing technique with IQF (Individual Quick Freezing) method is the time of rapid freezing, the water content in the material can be completely used up and large production capacity.